The Great Designer designed designers. An exploding mass cannot design anything, much less design a designer. Genesis 1:28 confirms concerning mankind: “Then God blessed them, and God said to them, ‘Be fruitful and multiply; fill the Earth and subdue it; have dominion over the fish of the sea, over the birds of the air, and over every living thing that moves on the Earth.’” Thus began the field of engineering. Using our ingenuity, humans have since engineered many ways to fulfill the commands to “subdue” and have “dominion over” the Earth, from harnesses for oxen to automobiles to space shuttles and beyond. God created the Universe with potential for infinite growth in human knowledge that can lead to many improvements in living conditions when we learn to harness and utilize the phenomena God designed and implemented on Earth for us to discover. Consider the effect that harnessing the power of electricity, magnetic fields, nuclear reactions, and chemical reactions has had on life as we know it. Unfortunately, as the poison of atheism becomes more prevalent in society, encroaching into the field of engineering, we can be guaranteed that progress will be slowed, and eventually, stopped or even reversed. 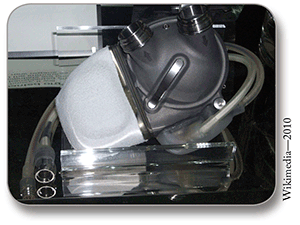 An image of an artificial heart exhibited at the London science museum. A few years ago, I attended a Bio-engineering seminar concerning design improvements on artificial hearts for use in transplants. After the presentation, during the question and answer period, a professor stood up and asked the presenter a question that went something like this: “Has nature optimized the heart yet after all of these millions of years of its evolution, or is it still necessary for us to help it along with our designs?” At that moment, it struck me how dangerous the Theory of Evolution can be if allowed to run rampant in the field of engineering. Those who follow out the implications of the Theory of Evolution could cause not only a hindrance to scientific and technological progress, but could actually place us in mortal danger. How so? However, if the Theory of Evolution is false, and the God of the Bible is the Chief Engineer of the Universe, an evolutionary approach could be very dangerous. To tamper with the design of the Almighty Engineer of the Universe would be tantamount to placing oneself above Him in knowledge and declaring oneself to be omniscient. Consider also that science is constantly evolving as research is conducted. Views once held as fact have been radically revised or even abandoned. Though some people for centuries held that the Earth was flat, modern science has proven that the Earth is spherical. The medical practice of “bleeding” a sick patient to eliminate ailments in the blood was common only 200 years ago. However, through further research and scientific investigation, and following many deaths, such a practice now seems barbaric. Now consider an example that could be directly relevant today. 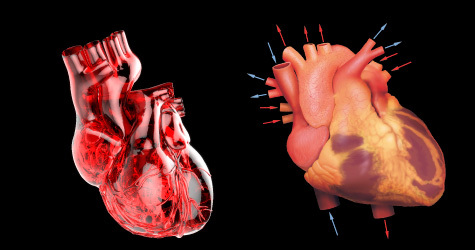 If humans become arrogant enough to think that we have the knowledge necessary to improve the design of the heart, act on those feelings, and then find out through further research that the design of the heart was actually already optimal, what damage could have been done in the process? Those whose hearts had been “improved” by the wisdom of mankind, could have shorter life spans or suffer major physical complications due to the arrogance of atheistic engineers. Thus, humans could potentially be harmed due to atheist engineers making design decisions without adequate understanding of the intricacies of God’s design! No wonder Almighty God, by the hand of Paul, warned: “Let no one deceive himself. If anyone among you seems to be wise in this age, let him become a fool that he may become wise. For the wisdom of this world is foolishness with God. For it is written, ‘He catches the wise in their own craftiness’; and again, ‘The Lord knows the thoughts of the wise, that they are futile’” (1 Corinthians 3:18-21). Many other examples illustrate the dangers of atheistic engineering. Since sin entered the world in Genesis three and mankind was evicted from the Garden of Eden, the pristine conditions of life on Earth have severely deteriorated. The Earth, as well as the general condition of the human body, is running down as the Second Law of Thermodynamics implies. Disease and genetic mutation, for example, attest to this. Isaiah declared: “Lift up your eyes to the heavens, and look on the Earth beneath. For the heavens will vanish away like smoke. The Earth will grow old like a garment, and those who dwell in it will die in like manner....” (51:6). We have used God-given engineering abilities to combat some of this decline through designs of our own, including, for example, medicine to combat disease, and sophisticated structures to withstand the forces of natural calamity. However, with a warped perspective about Who the Author and Designer of the Universe is, mankind could attempt to fix things that do not need fixing, and thereby bring calamity, suffering, and unhappiness. Now consider: If engineers would respect the Chief Engineer Who has surrounded us with amazing prototypes—an engineering school into which we have all been admitted—they could make quicker and better advancements in technology. Engineers of the past understood this. The Wright brothers, for example, analyzed birds to determine how to get an airplane to stay in the air (Fausz, 2008; Root, 1905), thereby achieving their objective. However, evolutionists will tend not to use God’s optimized designs since, to them, there is no ultimate Engineer to mimic. Rather, they are the results of a multitude of random accidents. Evolutionists would, therefore, have to recognize that optimized designs could not possibly come from an explosion. [NOTE: Ironically, many evolutionists openly gape at the amazing complexity and seeming design of the world, and yet fail to recognize the implications of their awe (Block, 1980, p. 52; Jastrow, 1981, pp. 96-97; Lipson, 1980, 31:138; Wylie, 1962, p. 25).] Thus, technological advancement is slowed and designs often will fail to reach their potential. If scientists fail to ask the right question, we will begin to see notable deleterious effects in the field of engineering. If engineers ask the right question, they, and indirectly we, will continue to have major advancements in technology as blessings from the Chief Engineer. What is the right question? The correct question to ask is, “Why did the Chief Engineer do it that way?” Studying that question will help us to have better “dominion” over the Earth. He designed the Earth, and we can be assured that His design, and the rationale behind His design, will be very useful. After all, who could possibly out-design the Chief Engineer of the Universe? Block, Irvin (1980), “The Worlds Within You,” Science Digest, special edition:49-53,118, September/October. Fausz, Jerry (2008), “Designed to Fly,” Reason & Revelation, 28:9-15, February, [On-line], URL: http://apologeticspress.org/articles/3599. Lipson, H. S. (1980), “A Physicist Looks at Evolution,” Physics Bulletin, 31:138, May. Wylie, Evan M. (1962), Today’s Health, July.